These fitness moves are so much fun, your family won’t even know they’re working out! In our house, fitness has become a way of life — not just a “thing” that we set out to do as a chore or a necessary evil. We’re making it fun, and we’re doing it together. It wasn’t always that way, but since I’ve lost weight and gotten in shape, the kids and I would rather spend a Saturday afternoon racing bikes and scooters than watching a movie. Being a full-time working mom with a long commute and lots of work travel used to make it tough to fit in exercise, but I’ve learned that if I incorporate my kids into my fitness program, it takes away a lot of the obstacles, and the kids get a lot out of it. Instead of leaving them for an active afternoon on my own, I can find ways to turn the afternoon into an active family event. As for sports, hockey is the ruling sport in our house, and my 4-year-old is completely obsessed. On any given day, we can be found playing hockey indoors on the hardwood floors. All it takes are kid-sized sticks, soft pucks or balls and socks for sliding around on the floors. Goal nets are a bonus, and we’ve used anything from a kitchen chair to a plastic bin — creativity is key! Additional indoor activities that get a huge thumbs-up from the kids are workout videos, yoga or Pilates. My kids enjoy lifting their pretend weights made out of toys, and they also enjoy doing pseudo-planks or jumping jacks right alongside me. Sure, you may end up with a toddler sitting on your abs as you try to do crunches, but hey — the extra resistance training can be great for your core! This summer, I tackled my first triathlon, and I did a lot of my training for the swim at the neighborhood pool — with my daughter. She didn’t exactly swim 20 laps with me, but she is a strong enough swimmer to swim on her own in the pool while I hit the lap lane. We joked and smiled on my breaks, and we swam together after I finished. We raced, played and worked on her swimming skills. Let’s face it: My kids don’t know how to play tennis. But one thing I’ve discovered is this: The worse your opponent is at tennis, the more you run. And since the running is in short bursts, it’s really excellent interval training, with a bonus of some core training, too. Reaching and grabbing and bending for the tennis ball is really similar to boot-camp workouts and exercise classes I’ve done. If your track allows it, your kids can have some fun activity while you get in a more serious speed workout. My kids think the track is the best playground around, what with the bleachers, the markings on the track and the grassy area in the middle. They run and jump and race each other while I run. I need to be sure that they aren’t in the way of anyone else who’s working out, but other than that, it can be a great outing with the kids. I used to stand in the alley behind our house with a cup of coffee and watch my kids ride their bikes. Now, we all situate ourselves behind an imaginary starting line — with each of us on a different vehicle — to see which one of us can take the speed prize. One child rides a scooter, one rides a bike, one rides a buggy, and one is in the stroller with me pushing. Then we rotate for the next race. Once my daughter gained some confidence on her bike, we realized that her biking speed is similar to my running speed. If I’m running with her little brother in the stroller, it can take some coordination to avoid playing bumper vehicles — but either way, it’s a win-win situation. We have also done this with her scooter. We have a hilly park nearby, with great trails for running and biking. It came as a surprise to me how much the simple act of running down a hill can excite kids. Take advantage of that and do a few hill repeats while the kids run up and down as well. I guarantee you will leave the park with a smile and fun memories. My kids love to walk the dog with us, and we often make it a family outing. It’s especially nice in the winter, when the neighborhood is aglow with Christmas lights. Taking the dog out for a stroll can be a great way to get in some activity as well as some quality time with the kids. 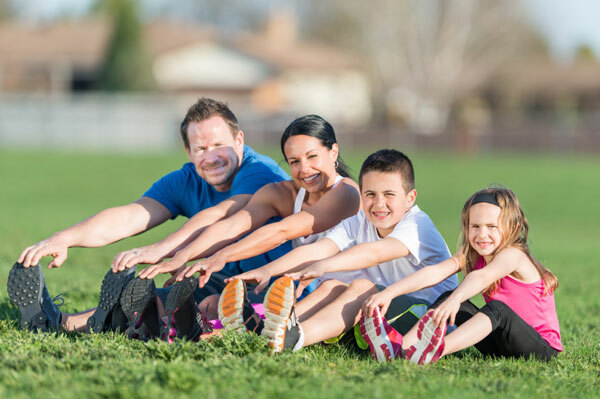 With a little creativity and planning, incorporating the kids into your fitness program is a win-win for everyone. And as a family, we can stay active and healthy and have fun in the process.